Canada’s Minister of Natural Resources, the Honourable Jim Carr, recently announced funding of $6.45 million for six projects in British Columbia to promote innovation and diversification in forestry and support collaboration with Indigenous communities. The Tsay Keh Dene CHP Biomass Energy project: $25,000 to assess the feasibility of bioenergy to reduce the reliance of the Tsay Key Dene community on diesel fuel for heat. The community is considering an Organic Rankin Cycle biomass plant as its technology of choice. The Kwadacha First Nation will receive a total of $143,000 for two projects: $98,000 to support a community combined heat and power bioenergy system, and $45,000 to undertake a review and prepare a report of their experiences and lessons learned from a successful green-energy initiative in the community that uses local beetle-killed timber to fuel a bioenergy plant for the generation of electricity and heat. StructureCraft became the first North American manufacturer of DLT (dowel laminated timber) when it opened a manufacturing facility in Abbotsford, B.C., last fall. The facility sets a new standard in industrial building design with wood. Prefabricated wall and roof panels are designed with a variety of mass timber and engineered wood products, including DLT, LSL, NLT, and Glulam. To demonstrate the flexibility of mass wood in industrial buildings, StructureCraft designed the entire building as a demountable structure, providing flexibility to expand or move the facility entirely to a new location. “Our team aimed to develop a signature structure and to expand what’s possible with wood from fast installation to cost effectiveness. The erection of the timber superstructure commenced on a Monday, and our crew had the entire building installed by that same Friday. In just one week, all four walls and a 40,000sqft roof are now up,” says Lucas Epp, head of Engineering. 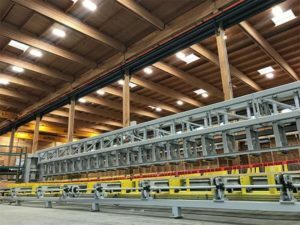 An automated production line using custom-designed machinery from Europe has been installed in the new timber facility to produce dowel laminated timber. StructureCraft says this production line is the largest capacity DLT line worldwide, and has launched a new cost-efficient mass timber product into the rapidly growing North America market. Subsidizing through direct cash infusion along with picking winners and losers is not beneficial but if aerospace receives it why not forestry.